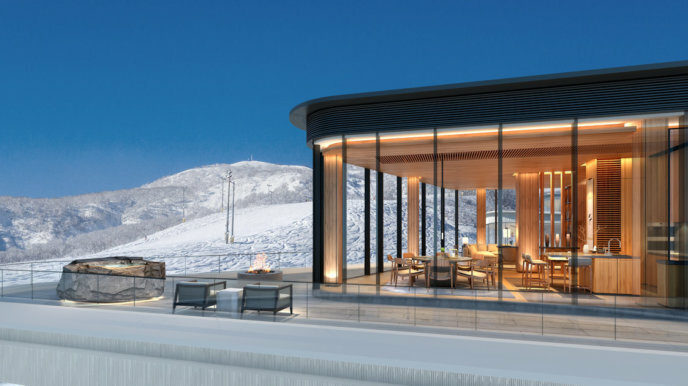 New developments are rapidly popping up in Niseko and are helping create one of the best ski destinations in the world. Sky Niseko will be the largest ski-in-ski-out accommodation with the highest altitude in the Hirafu area. The luxury hotel will be the first privately owned condominium hotel located at the top of Hirafu village. ARUKU-ZAKA STREET will consist of residential condominiums, serviced apartments, guest rooms, retail space for both local and international brands with a large variety of food and beverage outlets. Scheduled for completion in early 2022. Setsu Niseko, the luxury hotel situated near the Hirafu gondola will encapsulate elegant design and an appreciation for Niseko’s natural surroundings. Completion date to be announced later in 2018. Park Hyatt Niseko will offer a variety of facilities including spa, wellness facilities, swimming pool and access to Hanazono Golf Course. The new luxury hotel is scheduled to open in December 2019. Haku Villas is scheduled to be open for Chinese New Year 2019 and offers guests more privacy and space accommodation options. The Villas have an outside onsen with a spectacular of view of Mt Yotei.